Damien McGrane is one of four players disqualified for signing for a wrong score in the opening round of the Open de France. He failed to read a local rule and was disqualified for taking an incorrect drop on the water-protected, par-four 18th. Rory McIlroy tells CNN’s Piers Morgan how important Holly Sweeney is to him. Rory McIlroy’s view on his former idol, Tiger Woods. Greg Norman on Rory McIlroy’s US Open win. Paul McGinley before his 500th European Tour appearance in the Scottish Open. Padraig Harrington fails to make the weekend at Sandwich. 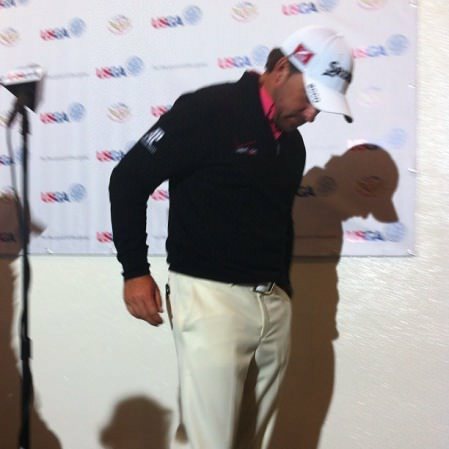 Graeme McDowell after missing the cut in the Open. Darren Clarke asks and answers all the key questions on the eve of the final round at Sandwich. Rory McIlroy slags off the weather at the Open and lands himself in hot water with the British press. Champion golfer Darren Clarke on the 18th green at Royal St George’s. Darren Clarke speaking to a group of mainly British journalists invited to his celebration barbecue on Sunday night. Chubby Chandler on his plans for the Open champion. Bob Rotella inspires Darren Clarke to take it easy during the Open with a quote from Vince Lombardi. Caddie John Mulrooney on his tense relationship with Darren Clarke early in Open week. Chubby Chandler calls for a wide berth for McIlroy after his negative comments on playing in bad weather. ISM statement issued shortly before pictures of McIlroy kissing Caroline Wozniacki appeared on the internet. Darren Clarke plays down his agent’s claim that he seriously considered quitting golf after a bad weekend in the Hassan II Trophy in Morocco in April. Lisa Maguire made a mockery of her non-selection for the GB&I Vagliano Trophy side when she became the first Irish player to win the prestigious European Ladies Individual Amateur Championship at wind-lashed Noordwijk in the Netherlands. Paul McGinley on what Seve called ‘destino’. So said Darren Clarke, glancing sideways at his Ferrari 612 Scaglietti, when asked if he was struggling financially following reports of cash flow problems. Padraig Harrington on his putting woes. They didn’t go away. Darren Clarke doesn’t quite reject the dark side altogether. Rory McIlroy reacts angrily on Twitter after on-course commentator Jay Townsend tweeted that he’d just watched “some of the worst course management I have ever seen beyond under 10’s boys golf competition.” McIlroy had 545,000 followers at the time. By the end of the year he had close to 760,000. Padraig Harrington after missing the cut in the Irish Open. Less than 24 hours later, he sacked Bob Torrance. Rory McIlroy stands by his tweets about Jay Townsend. Padraig Harrington on his reasons for sacking 79-year old coach Bob Torrance after almost 15 years together. Bob Torrance on his split with Padraig Harrington. Graeme McDowell on the Harrington-Torrance break-up. Paul Cutler after finishing tied 21st as an amateur in Killarney. Irish Open champion Simon Dyson. Darren Clarke on why we should root for Tiger Woods. Rory McIlroy all but confirms that he’s rejoining the PGA Tour in 2012. Rory McIlroy on how life has changed for him in Northern Ireland since he won his first major. Caddie Steve Williams steals Adam Scott’s thunder at the WGC-Bridgestone Invitational. Williams did not miss the opportunity to dig the knife into ex-boss Tiger Woods, who has sacked him just a month earlier after 12 years and 13 majors wins together. Padraig Harrington seeks help less than a week after sacking Bob Torrance. Coach Pete Cowen on his chats with Padraig Harrington. Rory McIlroy sits on the fence this time when asked about golf in the Games. Rory McIlroy rejects claims that his bagman JP Fitzgerald should have stopped him playing the fateful seven-iron from a tree root in the first round on the US PGA. He ended up in hospital with a badly injured wrist. Hall of Fame legend Pat Bradely on nephew Keegan’s US PGA victory. The self-effacing reaction of Padraig Harrington after a wobbly finish left him sweating to see if he’d done enough to make the top 125 who would tee it up in the first event of the FedEx Cup play-offs. He had. Just. Harrington won’t say ‘never’ when it comes to the long putter. Padraig Harrington confesses that life is tougher for him without square grooves. Padraig Harrington on the musical instrument he might fashion from a vegetable. Coach Pete Cowen hilariously recalls Darren Clarke’s pessimism early in Open week. Paul Cutler on winning the Walker Cup at Royal Aberdeen. He was unbeaten in his last event as an amateur. Michelle Wie on being a child prodigy. European skipper Alison Nicholas on Europe’s dramatic 15-13 Solheim Cup victory at Killeen Castle. Darren Clarke wants to be Ryder Cup captain. The question is, when? Padraig Harrington speaks to the press on Friday monring after being disqualified from the Abu Dhabi HSBC Golf Championship for signing for a wrong score the previous day. Picture Eoin Clarke/www.golffile.ieThe year provided some obvious highs for Irish golfers with Rory McIlroy’s US Open coronation, so soon after his Augusta agony, swiftly followed by Darren Clarke’s long-awaited major breakthrough in The Open. But there was plenty more to keep Irish golf fans reading in 2011 and not all of it was on such an epic scale. Key people in Rory McIlroy’s life in 2011 - new girlfriend Caroline Wozniacki and new manager Conor Ridge. Pictured in Dubai on December 10 by Fran Caffrey/www.golffile.ieAll eyes will be on Rory McIlroy in 2012 following his major breakthrough at the US Open. His eight-shot win at Congressional was one of the stories of the year but he also captured headlines for his activities off the course and none came bigger than his decision to sack manager Chubby Chandler and take on Conor Ridge at Horizon Sports Management.